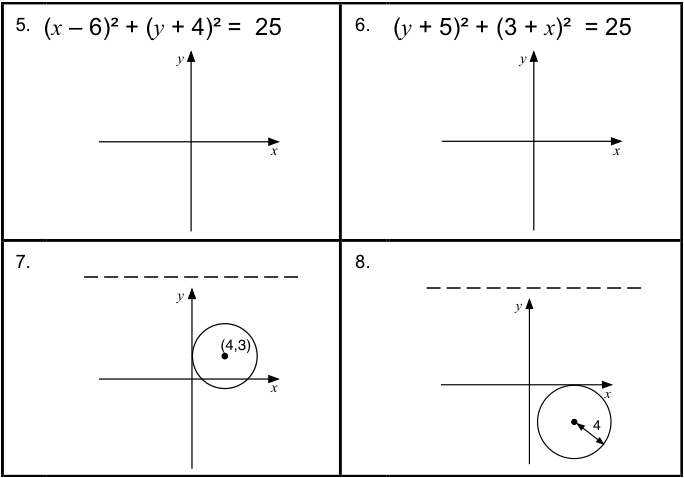 Translate between the equations of circles and their geometric features. Sketch a circle from its equation. During the lesson, students work in small groups on a collaborative task, categorizing equations and geometric descriptions of circles. In a follow-up lesson, students review their initial solutions to the assessment task and then use what they have learned to either revise the same task or complete a different task. Each student will need copies of the assessment tasks Going Round in Circles 2 and Going Round in Circles 2 (revisited), a mini-whiteboard, pen, and eraser. Each small group of students will need the cut up Table Headings: Categorizing Equations, Card Set: Equations 1 and Card Set: Equations 2, a large sheet of paper for making a poster, and a glue stick. You may want to copy the card sets onto transparencies to be used on an overhead projector to support whole-class discussions. There is also a projector resource to support whole-class discussions. 20 minutes before the lesson, a 90-minute lesson (or two shorter lessons), and 20 minutes in a follow-up lesson. Timings are approximate and will depend on the needs of the class.